I have the privilege of reviewing a new book being released today. It’s titled, Wives Of The Bible, and includes 25 lessons from women who’s stories are told in the Bible for our benefit. 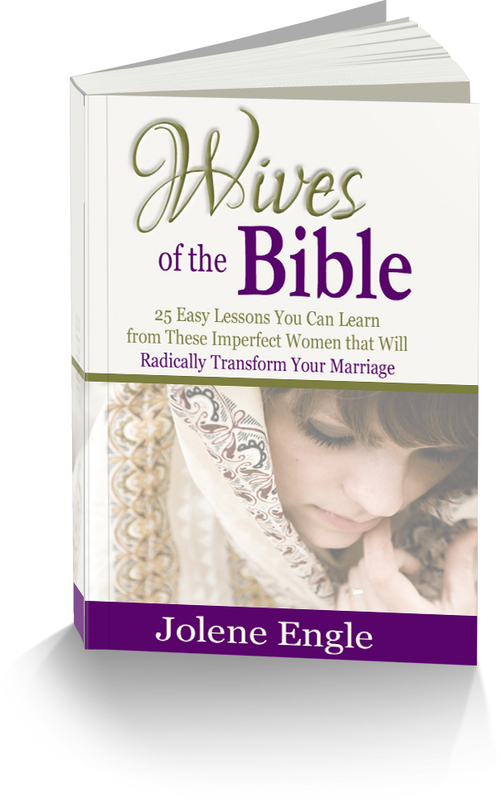 Jolene Engle does an excellent job of identifying characteristics of each wife that most of us can relate to at one point in our lives or another. It is easy to read and a pleasure to discover life-changing lessons from these women who lived long ago. Jolene is offering a free ebook to our readers. All you have to do to enter is watch the following book trailer and tell us by commenting what the last photo shows in the video. That’s it–You’ll be entered for our random drawing. The winner will be announced on Wednesday, so don’t delay. Share this post on your FB page for an additional chance to win. Simply mention in your comment that you also shared it on FB, and that will give you two entries into the drawing. 🙂 This book, which will be available in paperback soon, would make a great Christmas gift for all your friends and family members who are married or engaged. This entry was posted in Blog Love, Christian Marriage, Contests, Growing Strong Marriages, Wives and tagged Bible, Bible Study, Christianity, God, Jolene Engle, Marriage Resources, Religion and Spirituality, trailer, Wives Of The Bible. Bookmark the permalink. I think the last photo is of a bride and grooms feet. Thanks for entering and for sharing on FB. The last picture is of a bride and groom’s feet. Bride and Grooms feet. Shared on facebook! Black and white picture of bride and grooms feet. Bride, white gown, white shoes. Groom, black tux, black shoes. The last picture on the video is of Jolene. The last picture on the slide show is a black & white photo of the shoes of what looks to be a bride and her groom. Bride and groom’s feet. Also shared on facebook.